Rolando grew up in south west Detroit, a Hispanic district, he was heavily influenced by his cultural Latin rhythms and percussion. Inspired from an early age by his musician father, he pursued his own interest in music and became well known and respected within the community. It was later when he heard Jeff Mills in 1985 as "The Wizard" that he discovered the innovative sounds of Techno. Through a mutual friend he was introduced to Mike Banks and joined Underground Resistance in 1994. In 1999 'Knights of The Jaguar' although not Rolando's first release on UR turned perceptions of Techno on their head, breaking into other genres of dance music and becoming a classic in the boxes of DJs such as Tenaglia, Morillo, Oakenfold, and Gilles Peterson. The track has a long legacy of reworking and lives on fifteen years later inspiring audiences from all genres. 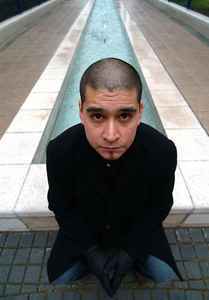 As of November 2004, Rolando left both Underground Resistance and his Los Hermanos project behind. 2014 Rolando has launched his own label R3 (Roland Rocha Records) and will exclusively release his own music on his label. Rolando now a Dj for almost thirty years continues to work internationally as a Dj and continues to hold a residency at the notorious and enigmatic Berlin club Berghain. Rolando will probably always be known for his "Knights of the Jaguar", which is definitely a good track. All of his other work on/as Los Hermanos is very good as well. Check out his remix he did for Kraftwerk's "Expo 2000" for a good example of his sparse, lush, melodic sound. Hell f---ing yes... I was lucky enough to catch his set at the last Detroit Electronic Music Festival and I can't say enough good things about this guy. After being into this scene almost twelve years I've seen hundreds of DJ's, and I'd easily place him in the top five, easy... he played tons of classics, doubled up two copies of "Strings of Life" and staggered the piano break perfectly before dropping in all sorts of minimal techno classics - "French Kiss", "Red 2", etc. Only a skipping record towards the end marred this otherwise perfect set. 90% of DJ's who try to mix on more than two turntables have no business doing so. This guy is in the other 10%... if he continues to throw down like this I don't think there's much stopping him in the years to come. Highly recommended for either techno or house fans. First time i heard about DJ Rolando, i just felt in love with what this guy does. There's for one time poetry, harmony, force and conviction in that music.